There’s nothing more frustrating than pouring your heart into a baking project only to have it stick in the pan and refuse to come out. I have ruined more than one creation when trying to get it out of a pan that wasn’t well greased. I had tried what seemed like every oil imaginable: grapeseed oil, olive oil, coconut oil and butter. Nothing seemed to work well consistently. 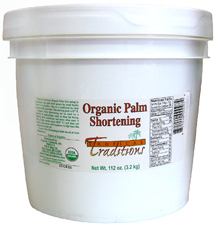 Then I decided to give palm shortening a try (palm shortening is nothing like Crisco – no hydrogenated oils). I have a gallon of it in my cabinet from Tropical Traditions, and hadn’t used it much so I wanted to learn how to use it anyhow. It almost has the consistency of soft butter, so I just scoop up a bit in my hand and then rub an even layer all over the pan. It’s thick enough that you can see that the pan is well coated, but light enough that it spreads easily. So far I have used palm shortening to grease pans for muffins, bread and cake – and none of them stuck! They came out of the pan super easy and totally intact! 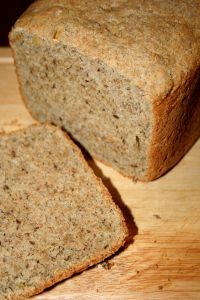 I really like using palm shortening because it doesn’t have a strong flavor, so it works well for most baking projects without imparting an off flavor. I am so happy to have found the best oil for greasing pans – palm shortening! Totally know what you mean. Just had that happen twice this week. I’ve got some palm shortening in the cabinet as well – I’ve yet to use.